Šim sadalījumam ir ieteikuma raksturs, tas nenosaka noteiktu iedalījumu. Piemēram, arī 18 gados var patikt aromāts, kas ir ieteikts 25 pluss kategorijā un otrādi. 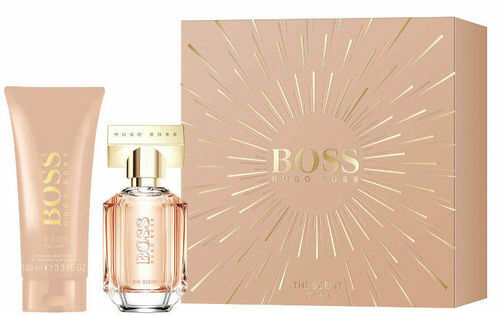 Get closer to discover the power of Boss The Scent for Her. Inspired by the art of seduction and the irresistible act of getting closer, Boss The Scent for Her is designed to elicit a hidden seductive power that envelops the woman who wears it with a captivating allure. Powerful and at the same time uniquely feminine the fragrance features an irresistibly potent combination of ingredients, mirroring the the story of seduction from attraction to seduction to addiction. This floral-fruity fragrance is combined with thick gourmand shades making it an equivalent of the modern perfume scene. Gourmand trendy composition touched many designer collections suggesting that the focus lies on sophisticated sweetness. The latest perfume of the Hugo Boss collection opens with juicy and velvety shades of peach combined with freesia blossom in top notes. The heart is based on osmanthus, famous for apricot scent, while drydown features roasted cocoa, which deepend the composition and provides a darker note and a characteristic gourmand twist.